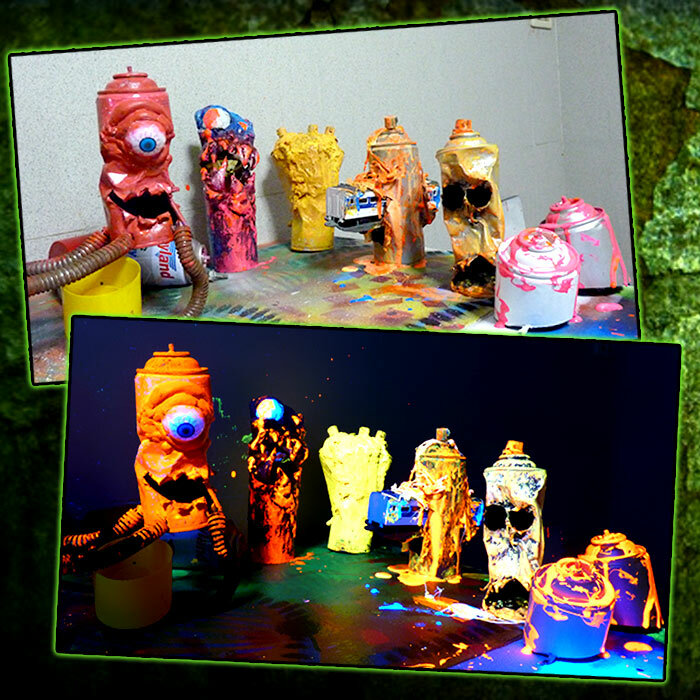 This is a photo of some UV reactive (black light) spray can art toy sculptures. These were taken in creation progress at my Bangkok arts studio. 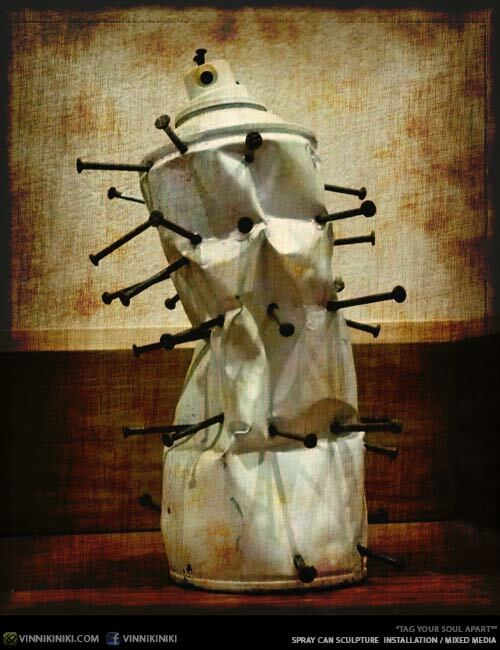 Some art i make is purely for self-satisfaction, other art i create using recycled materials, which usually result as a by-product of creating other art work; this is both. 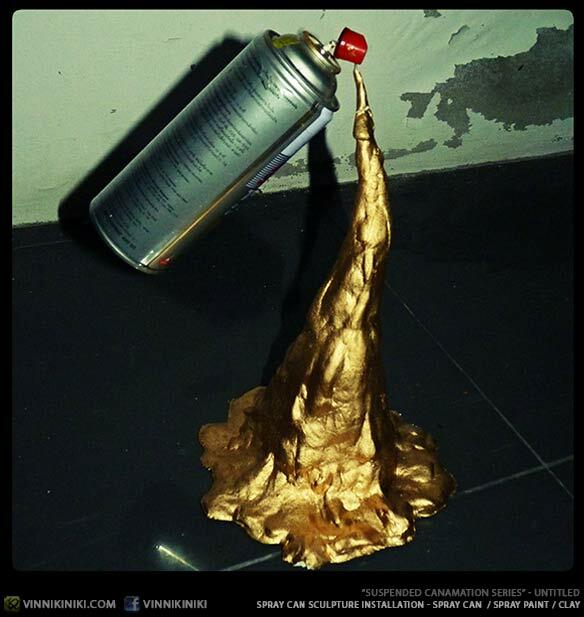 I make these spray can sculptures because i have A LOT of them lying around my studio. 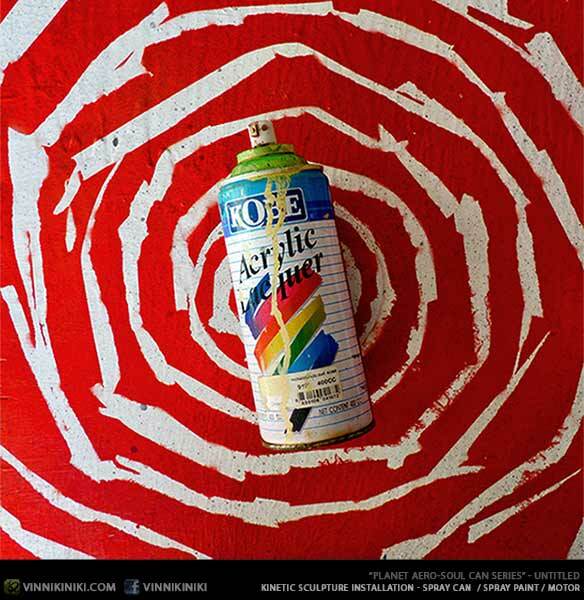 I paint a lot of graffiti style murals, so i use a lot of spray paint. 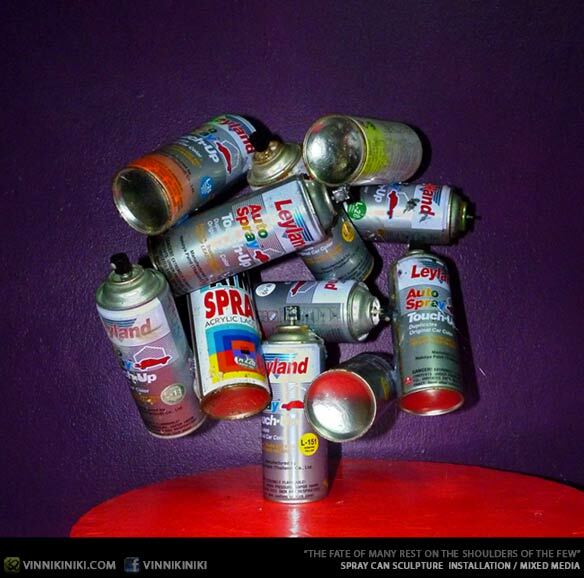 Being really passionate about the spray can both as a tool and as an iconic symbol (read this to find out more about the theory) i can’t help but stock pile all these empty spray cans. 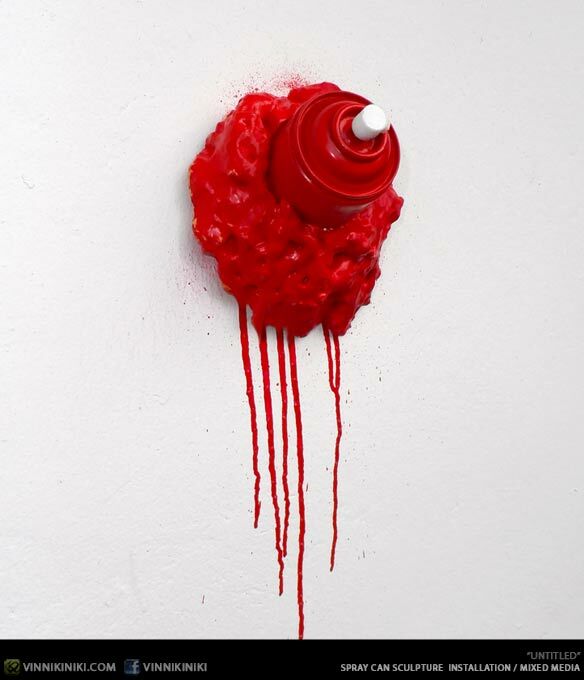 I have a hope that once I amass enough empty spray cans i will create some sort of large scale installation or sculpture out of them. 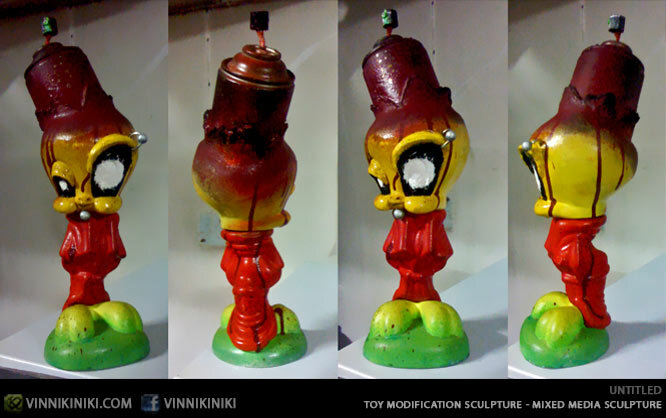 However in the meantime i create these spray can character toys. 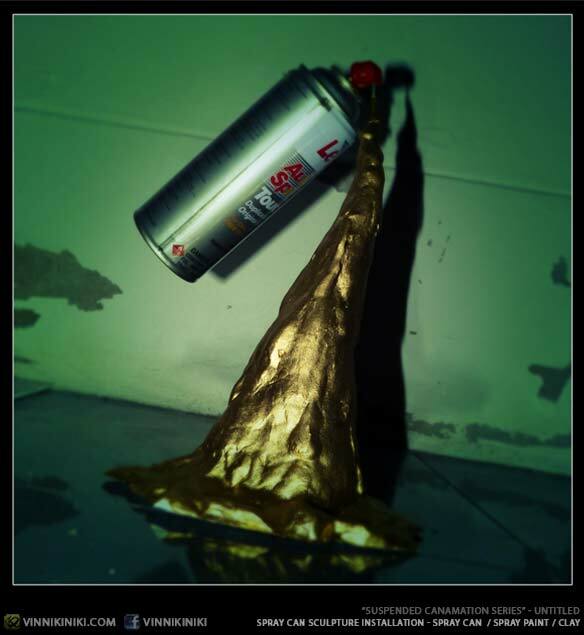 In a way they are an extension of the spray can character which I have been drawing in my sketchbooks and walls over the years… See more spray can sculptures below this article. These particular cans in the photo are made using various types of clay, resins, glues and foams; each piece has its own story so i won’t go into exact detail how each one was made, however you can see some more photos below which might explain more than words. 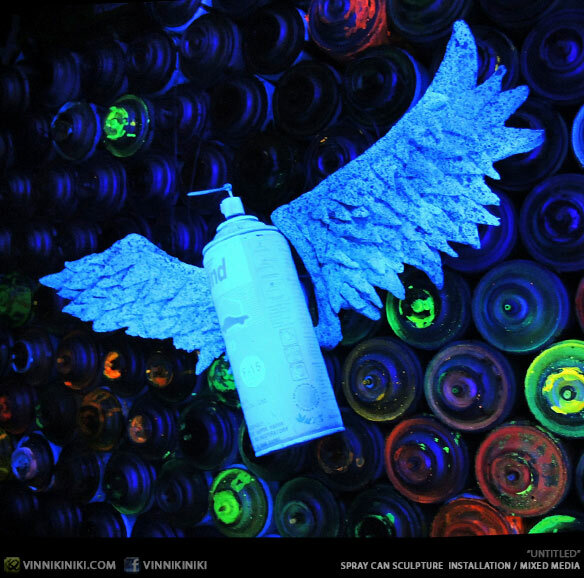 What is exciting about these spray can sculptures is that they were finished with a combination of UV reactive black light pigments and paints. I LOVE using black light; in fact you can see more related black light art on this page. I started painting with UV paint a long time ago and i must say to this day i still find it somewhat magical and it’s a shame there isn’t more UV art around… These pieces were designed to be exhibited in UV black light, as you can see from the photo below in normal light they look completely different. The trick is to paint and create in UV the whole way through, it’s a really interesting medium that requires a specific discipline. Well as i aforementioned these are pieces in progress, i am collecting and creating enough of these spray can sculpture pieces in order to have a group exhibition solely displaying spray can art. 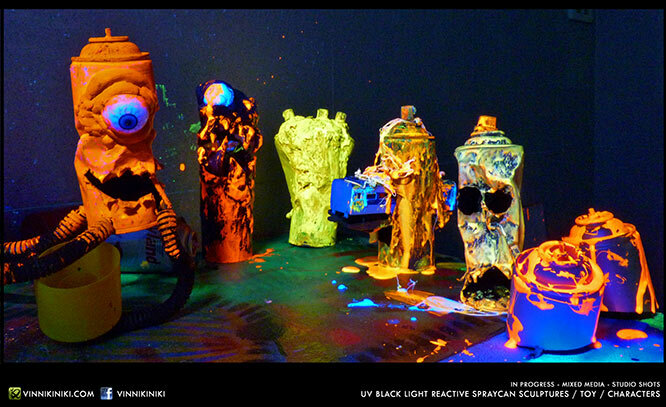 In that exhibition black light art would also be a heavy feature. I also have some spray can sculpture pieces which don’t rely on UV light so they would be shown separately or in a different area of the exhibition. I’m not really in a rush to finish these, if the exhibition doesn’t happen i can also live with it. 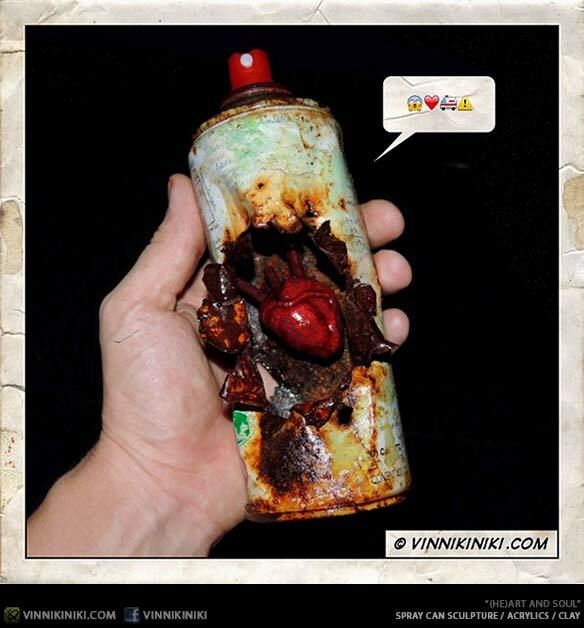 I create these spray can toys when i can and on my own time, i have sold a few and I’m not opposed to selling more… Just as long as the spray can army keeps growing I’ll be happy. So what do you think? Any advice for how to exhibit these pieces? Any requests for a spray can character you would like to see? Let me know in the comments below.